If you would like to talk in person, come to office hours or email me to arrange a time. If you would like to talk by phone, email me to arrange a time. I usually check email about twice a day, although I try to be more responsive at the beginning of the quarter. It may take as long as a few days for me to reply to mail. Please check that the email address on your CampusConnect record is correct. You don't need to send thank you messages to me, but let me know if my response was not helpful. This is the first course in a two-course sequence on data structures using Java. The course introduces basic Java programming, reviews recursion, introduces asymptotic notations, and focuses mainly on linear data structures including arrays, linked lists and their variants, stacks and queues, and data structures supporting disjoint-set operations. The implementation of the basic operations on each data structure are discussed and analyzed in terms of their efficiency. 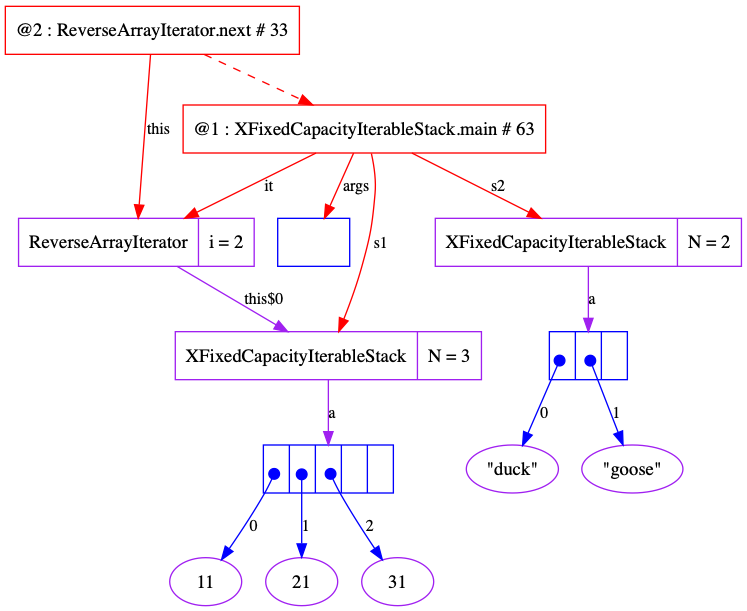 The applications covered highlight and exploit the unique characteristics of the data structures, and emphasize problem solving and recursive thinking. Understanding of stacks, queues, dequeues. I was volunteered to be part of a hiring team so have been spending lots of my time interviewing candidates, many of whom are not very talented. You should see these resumes. These guys have seven years of experience doing java web development, they list 80 java and web related acronyms on their resumes, and they can't write a method that prints the odd numbers from 1 to 100. Our goal is to make sure that you are not one of those programmers. Programming then is fun because it gratifies creative longings built deep within us and delights sensibilities we have in common with all [people]. An incomplete grade is defined in the Student Handbook as follows (note that the policy in the undergraduate student handbook applies to both undergraduate and graduate students): A temporary grade indicating that the student has a satisfactory record in work completed, but for unusual or unforeseeable circumstances not encountered by other students in the class and acceptable to the instructor is prevented from completing the course requirements by the end of the term. 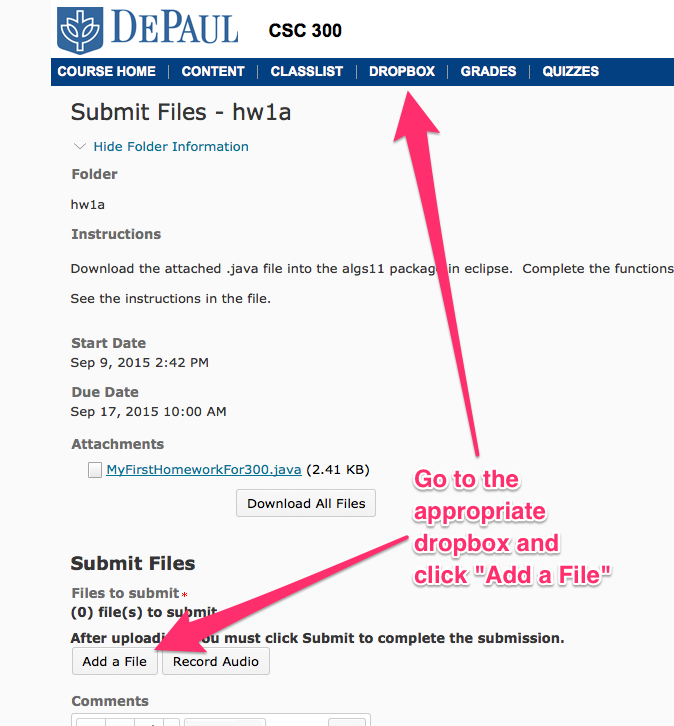 Please see http://www.cdm.depaul.edu/Current%20Students/Pages/Grading-Policies.aspx for additional information. CDM understands certain extenuating circumstances can hinder one's ability for academic success and completion of course work. Please see http://www.cdm.depaul.edu/Current%20Students/Pages/Enrollment-Policies.aspx for additional information. In order to petition for an excused absence, students who miss class due to illness or significant personal circumstances should complete the Absence Notification process through the Dean of Students office. 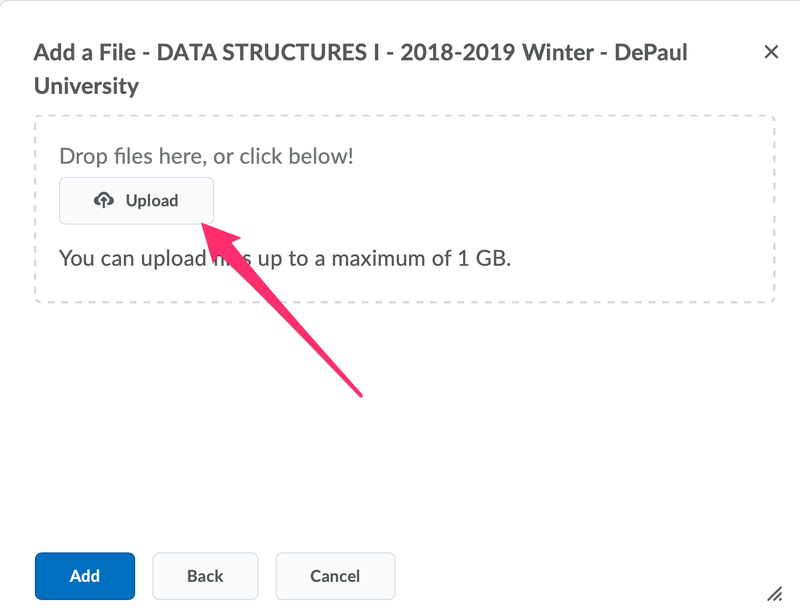 The form can be accessed at http://studentaffairs.depaul.edu/dos/forms.html. Students must submit supporting documentation alongside the form. The professor reserves the sole right whether to offer an excused absence and/or academic accommodations for an excused absence. You must subscribe to the course discussion forum on google groups. Do it as soon as possible. If your reply is intended for one person, please use Reply rather than Reply All . Please don't send thank you messages to the group. The discussion forum is an extension our time in class. This is particularly great for students that miss the live lecture. If you are watching the class online, you should write down any questions that arise, including the time from the recording for reference. Then send the list of questions to me, and I will post a reply to the group. I will also use Teamviewer for communication. With teamviewer, you can show me your computer screen while we talk over the phone. Grades will be determined as follows. You must pass the final exam in order to pass the course. Lecture slides may not be available before the class. Lecture slides may change after class. If you are delayed in getting the texts, you can view them online via Safari. Do not get an older edition. They are completely different books. This book is a good source of example problems with solutions. An good introduction to Java. Skip the GridWorld chapters, which are intended to help with the AP exam in CS. See also these lecture notes from MIT. The first three lectures are particularly useful. This is the first chapter of the introductory text written by the authors of our primary textbook. It presents the same material as section 1.1 of the primary text, but at a slower pace. The algorithms text describes all of the Java that is required for the class. The discussion is terse, making it an excellent reference. If you would like a longer discussion of Java, you might want a supplementary text. In this case, you might consider one of the following. We will discuss concepts in class. You will have weekly programming assignments. You do not have to do it alone, but you must be self-motivated. You can ask me and other members of the class. You must start assignments early. Getting the homework correct is not enough. The first time you solve something it could take days, and may require help. Once you get a solution, you are not done. First, try to make your code as simple as possible. It should be self-explantory to an average programmer, and include no unnecessary conditionals or extra lines of code. Then, create a copy of the homework and erase your solutions. Upon waking the next day, attempt to redo the problems. Do not look at your previous solution. Do not ask for help, either from friends or from the internet. Repeat this process until you can write each single function correctly in five minutes or less. Only then have you internalized the problem. Try to invent a variant of the problem that is easy to solve once you know how to solve this one. From the Chronicle of Higher Education: People often mistake familiarity for understanding. They open the textbook after getting home from a lecture, and they recognize the material. They think: I get this. Then they take a test -- and bomb it. I do not give out solutions to homework problems. I will show every solution during lecture. What I suggest is that while watching you lecture, you pause on any code you'd like the solution for, and type it in. I firmly believe that you will learn something in the process, that you will not learn by simply looking at my solution. Don't get discouraged if it's hard. Look on D2L for quiz to complete. Look on D2L for homework to hand in. 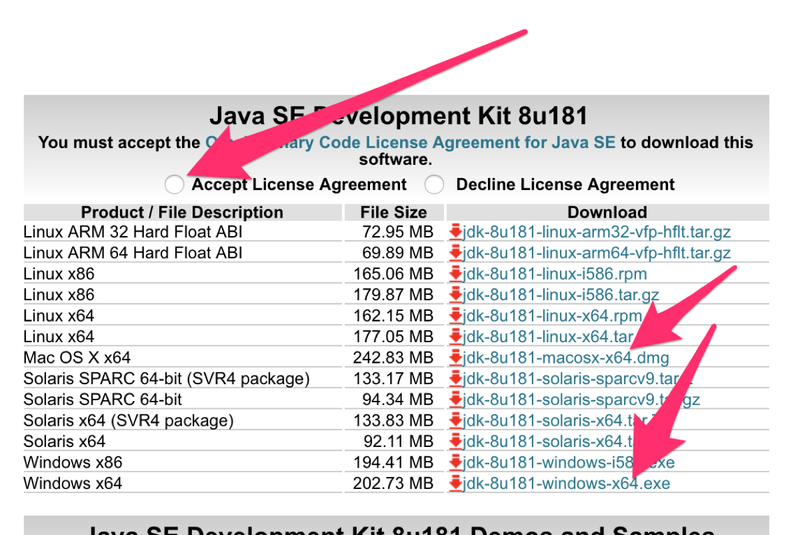 Install Java 1.8 (aka Java 8). Read chapter 1 of Core Java for the Impatient. Skim chapter 2 of Core Java for the Impatient. There's a free online version in case you don't have the text yet. Check out the links for the textbook on the course homepage. Check out the booksite. Find their notes on section 1.1, which gives a summary of the textbook. Check out the links for the textbook on the course homepage. You will find an online version of the textbook, videos, slides and more. You can also find lecture notes, homework assignments and old exams for the class at Princeton. We will use Java 1.8 (aka Java 8). 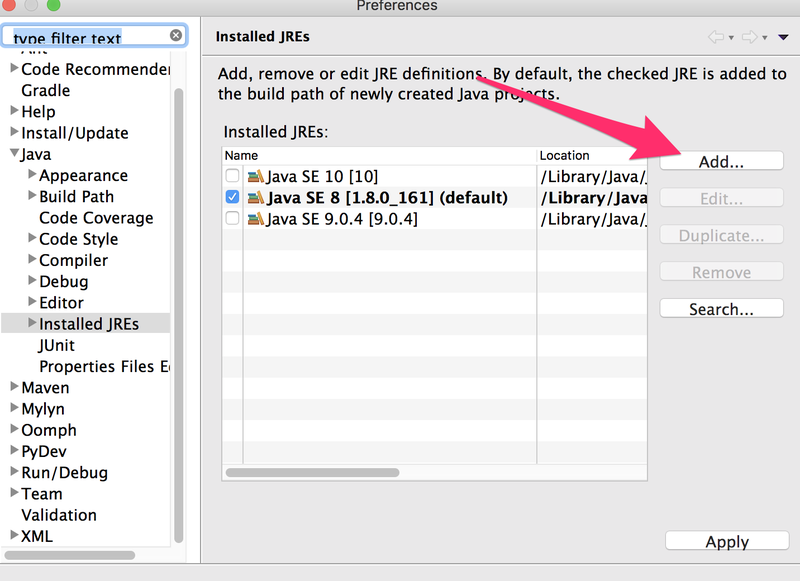 It is easiest to use eclipse if you remove any other versions of Java from your machine. For windows, use the uninstaller to remove other Java versions. 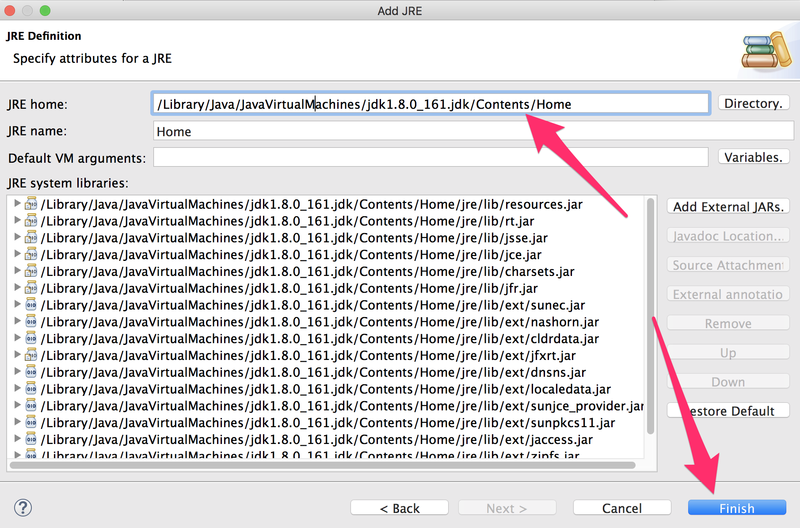 Get the Java SE Development Kit also known as the JDK. 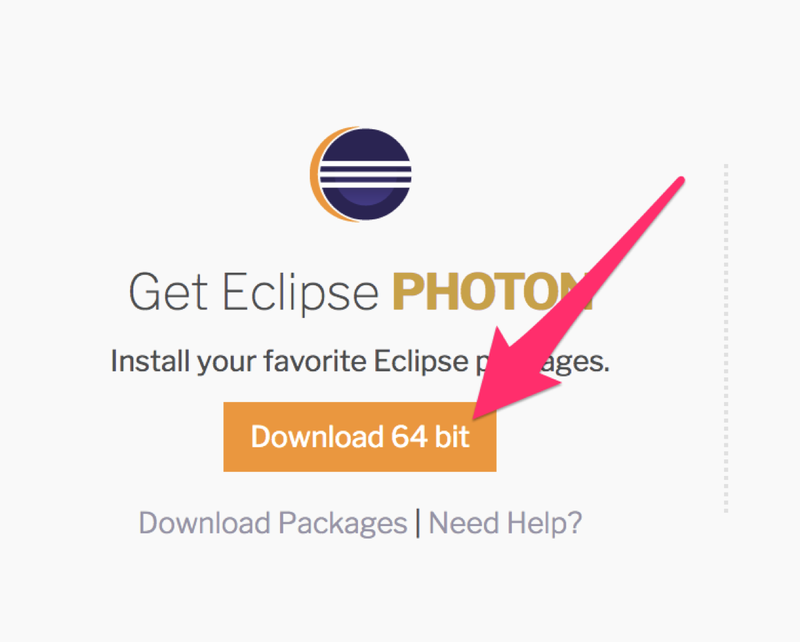 As long as you have a 64 bit machine, you should get the 64-bit version, rather than the 32-bit version. 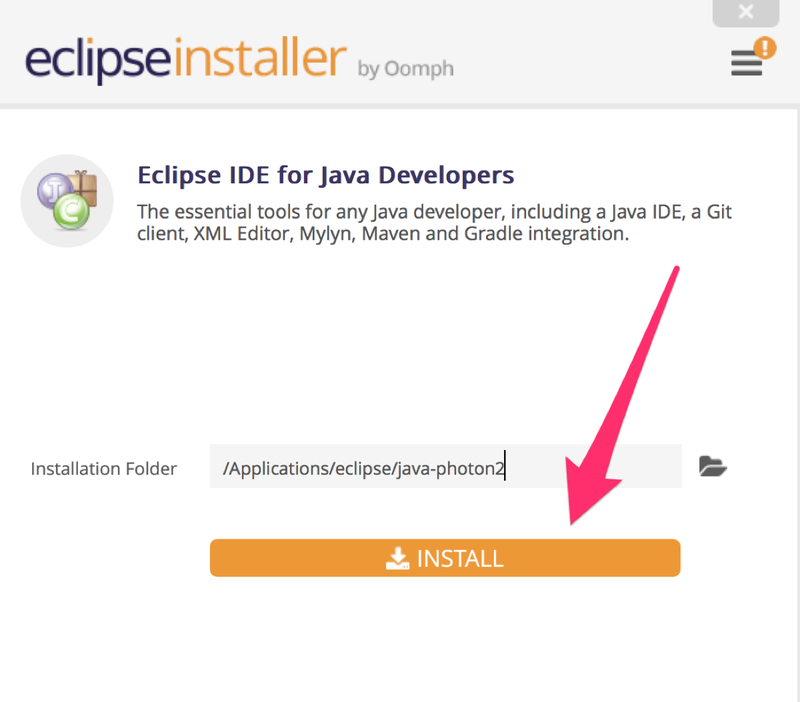 The java installer is an executable file, and you should run it. Get the most recent version. 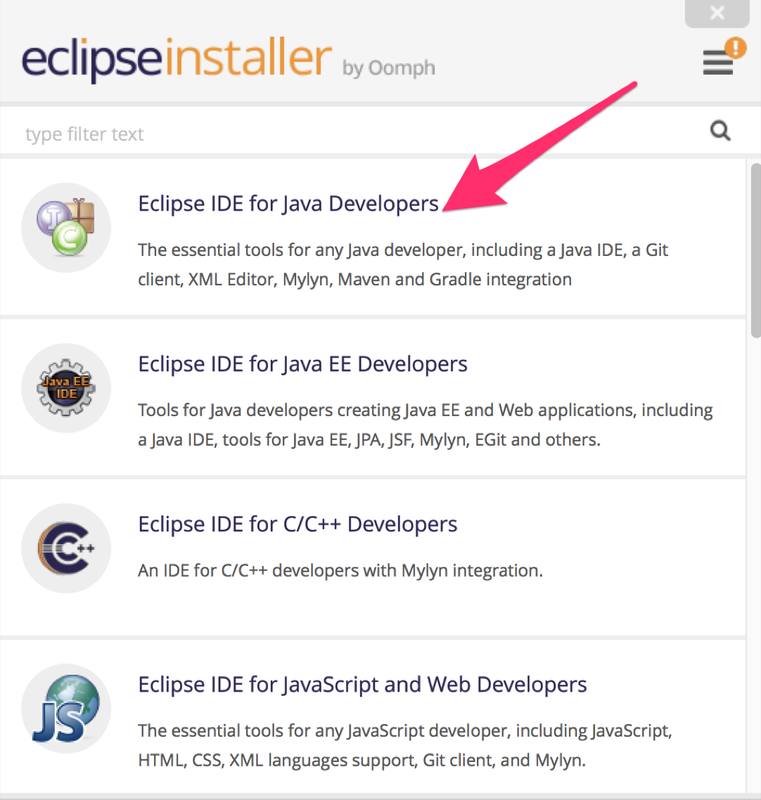 You should get Eclipse IDE for Java Developers . The main difference between versions is the number of packages that come pre-installed. This is the smallest version that has everything we need. This step is only necessary to draw the pictures that I show in class. 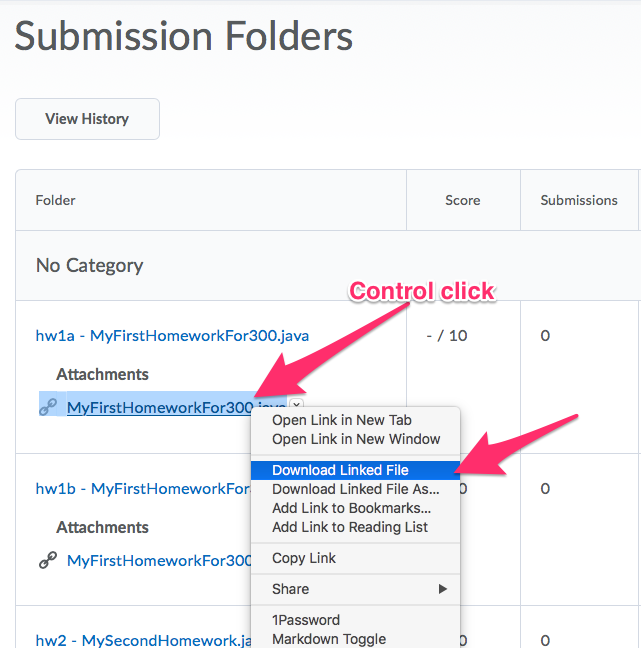 Unzip the file into the folder for class. This should create a folder called workspace. 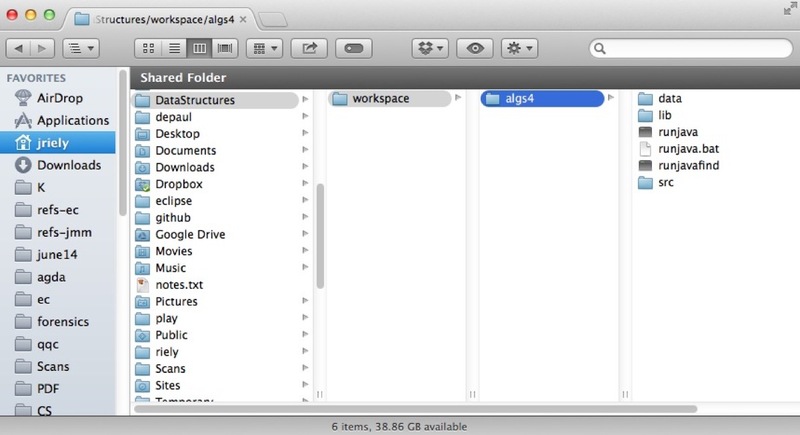 The workspace folder should contain algs4. 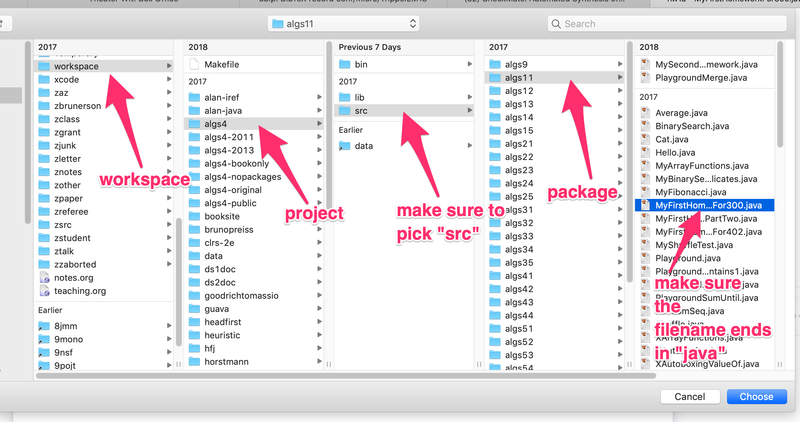 The algs4 folder should contain data, lib, src, and maybe some other things. Start eclipse. When it prompts you for a workspace, select your workspace folder. DO NOT SELECT THE algs4 FOLDER! Disable warnings for unnecessary code. LEAVE ALL OTHER WARNINGS AT THEIR DEFAULT VALUES. 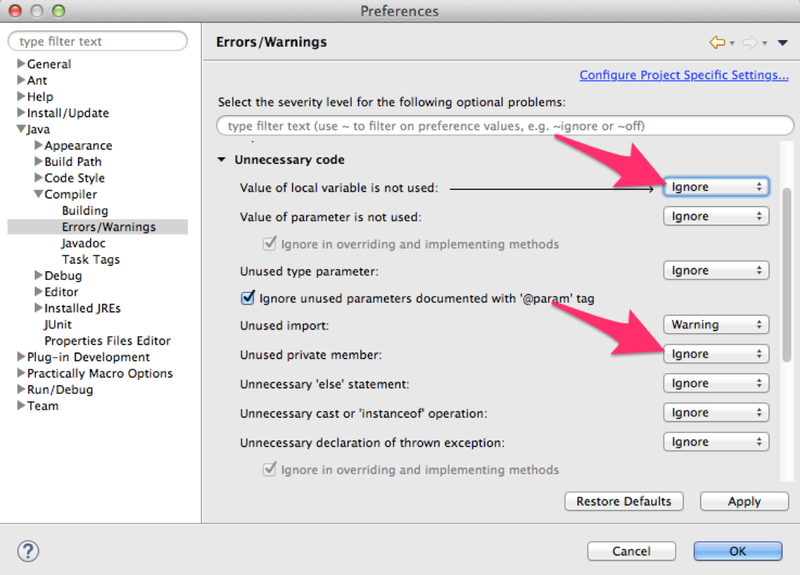 On windows, the "Preferences" option is under "Window" instead of "Eclipse"
Go to "Eclipse/Window" > "Preferences" > "Java" > "Compiler" > "Errors/Warnings" > "Unnecessary code"
Set the following to "Ignore"
"Value of local variable is not used"
Download the appropriate file from the Submission tab of D2L. Use control-click on mac, right-click on windows to download the file. 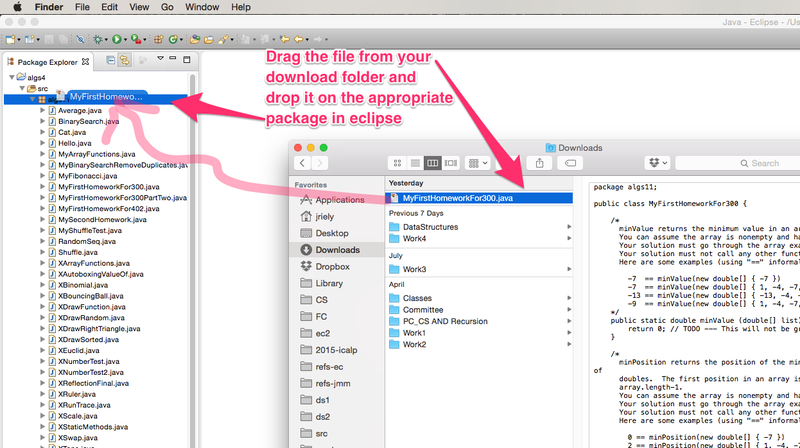 Use drag-and-drop to add the file to eclipse into the correct package. 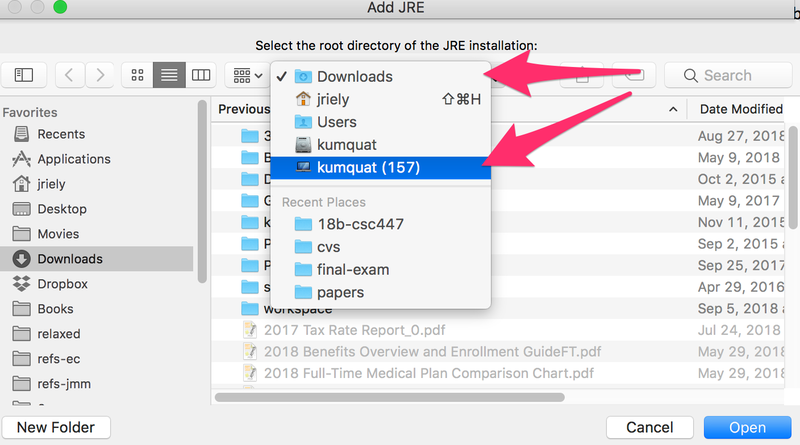 Use the finder to drop the file into the workspace. You need to put it in workspace\algs4\src\algs11. 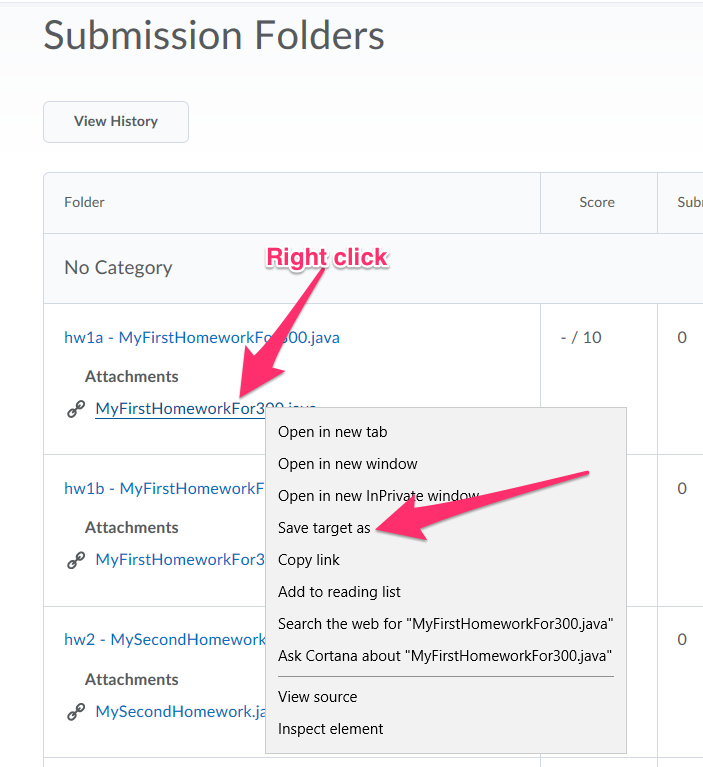 Make sure there are .java files there, not .class files. 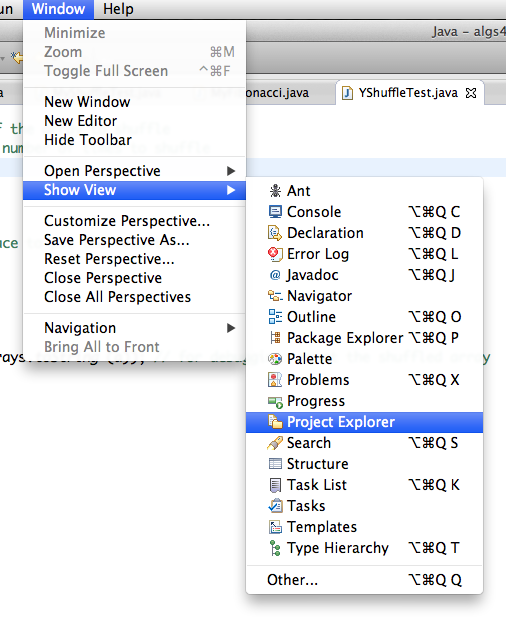 After you have it there, in eclipse, go to the File menu and select Refresh. 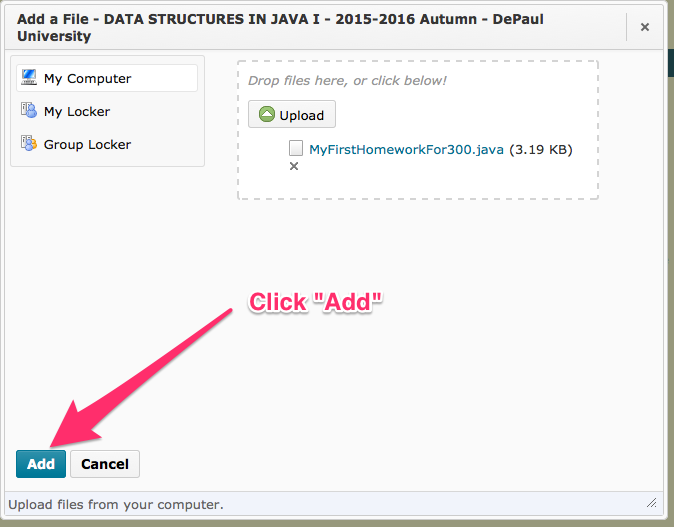 After you have completed the assignment, save your work in eclipse and use drag-and-drop to upload the file to D2L. If drag-and-drop does not work, you can use an alternative method, shown below. 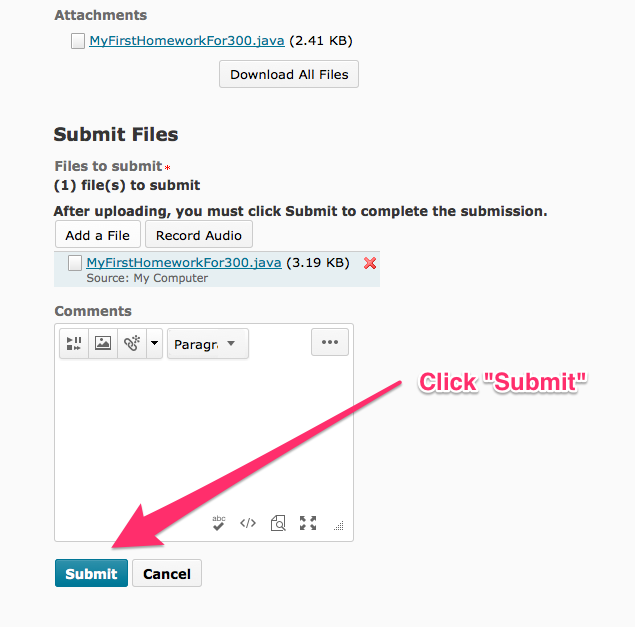 Be very careful to upload a .java file from the src directory. Do not upload a .class file from the bin directory. Uninstall everything and try again. If that does not work, email me ASAP. 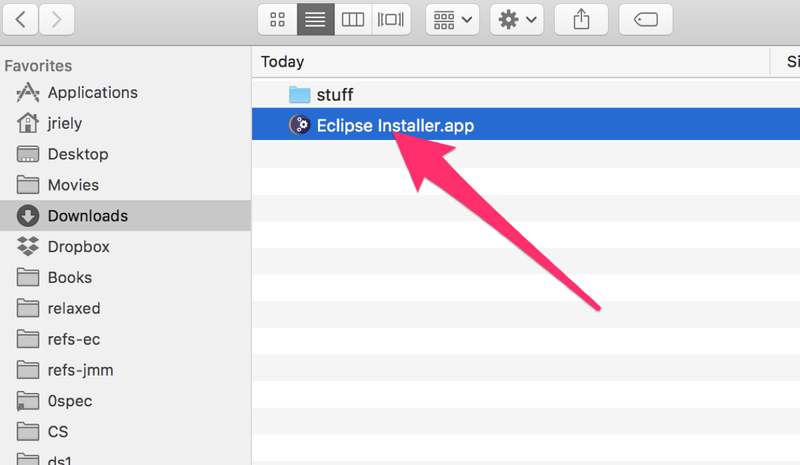 Don't waste time trying to fix a broken eclipse install. describe the problem. 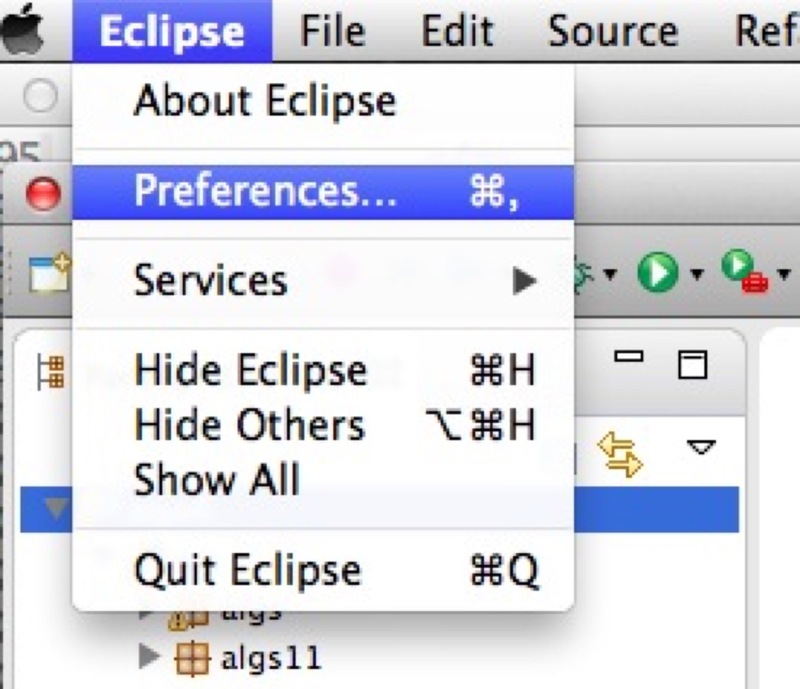 More detail than eclipse is messed up . Make sure that you are using Java 1.8. "Project" > "Clean..." > "Clean all projects"
If that does not work, try creating a fresh workspace. Using the finder, go to the folder that contains your workspace. Now start eclipse in the new "workspace". It should be as though you are starting eclipse for the first time. Follow the instructions provided earlier to add the "algs4" project and to turn off the warnings for unused variables and private fields. The above works by copying the good files to a new workspace. 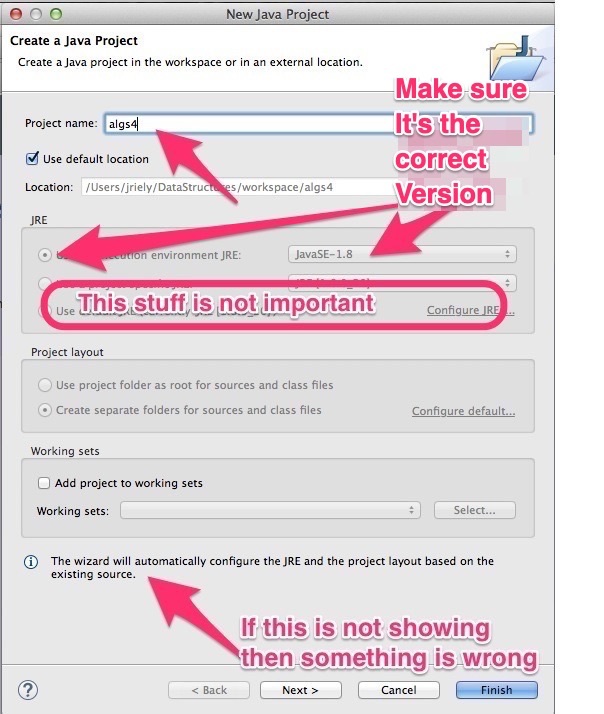 You can also try the following approach, which removes the problemantic files from the exiting workspace instead. To switch back, do the same but substitute FALSE for TRUE. Restart eclipse. You should have a blank workspace. If that does not work ensure that you have the correct version of Java installed. 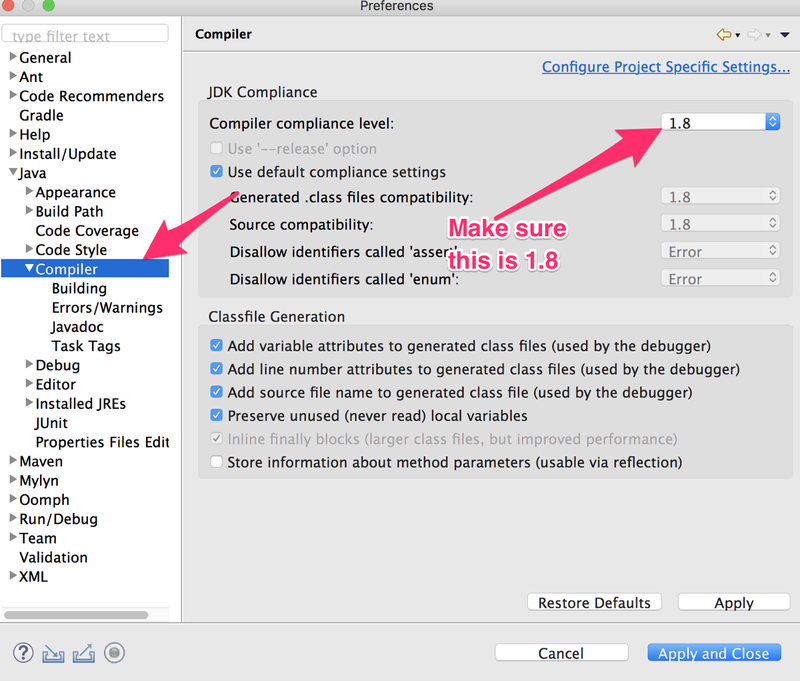 to make sure that compliance level is set to 1.8 and that a Java SE 8 runtime is checked. 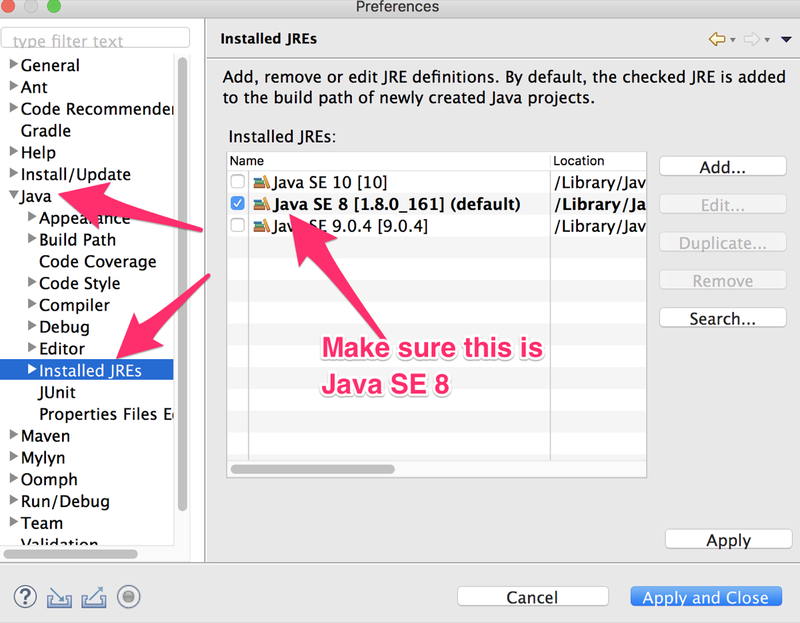 If you don't have Java 8, then you need to install it. The clean all projects as described above. 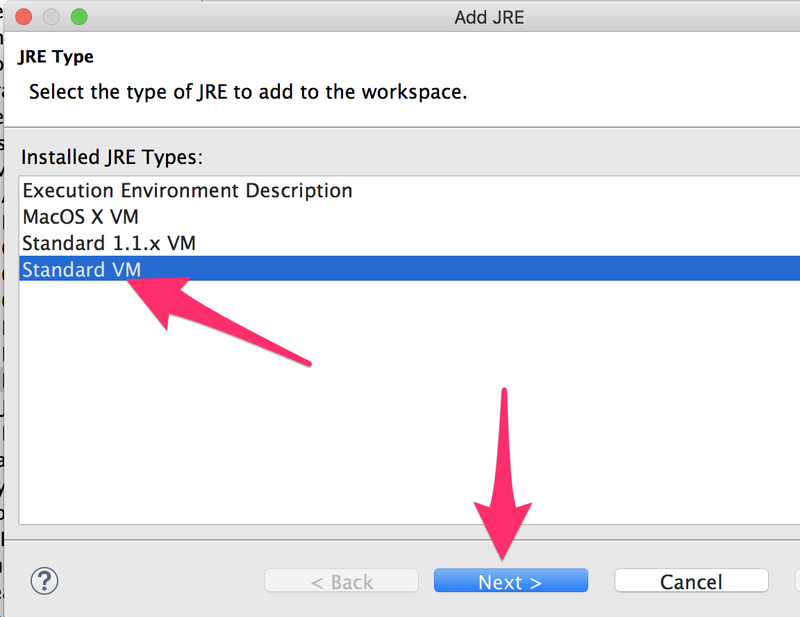 Eclipse will only include JREs that were present before it started in a given workspace. If you add a JRE later, the easiest thing to do is to recreate the workspace from scratch. See the instructions on the previous slide. First, make sure that you are running the code from the correct package in the src folder. Go back to the installation instructions for the code from class and make sure that the package explorer looks correct. If not, re-do the installation of the code from class, and start over. 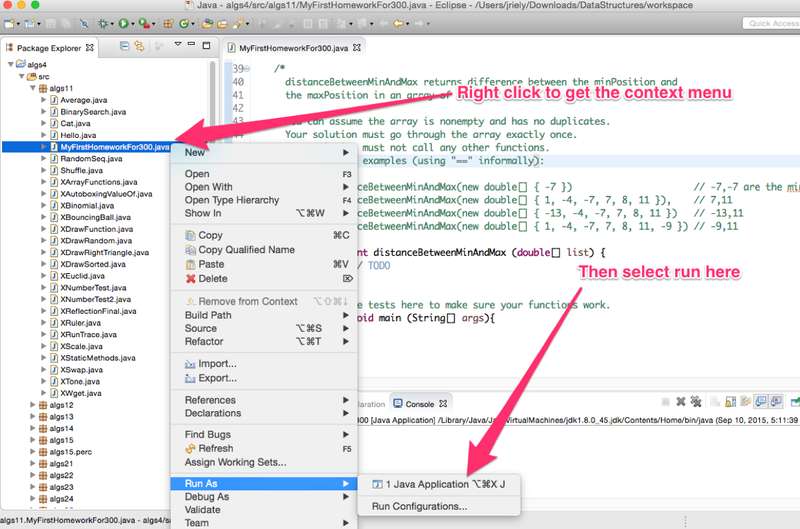 The run button is context sensitive in eclipse. It's behavior varies depending upon where the mouse was last clicked and what the last command to be run was. This problem usually sorts itself out. So try the run button again later. If you want advice about an error, send me email, doing one of the following. Include a screenshot showing the error. Copy and paste the EXACT TEXT of the error into your email message. Make sure that you clearly indicate the line with the error. If you have a problem getting a program to work and you want me to look at some of your code in more detail, send me email with the following three things. Your java file as an attachment. A description of how the output of the program is different from what you expected. The output of your program, if it runs. Every java program requires a main function. It must be declared exactly as on the third line above. Every java function resides in a class, in this case Hello. 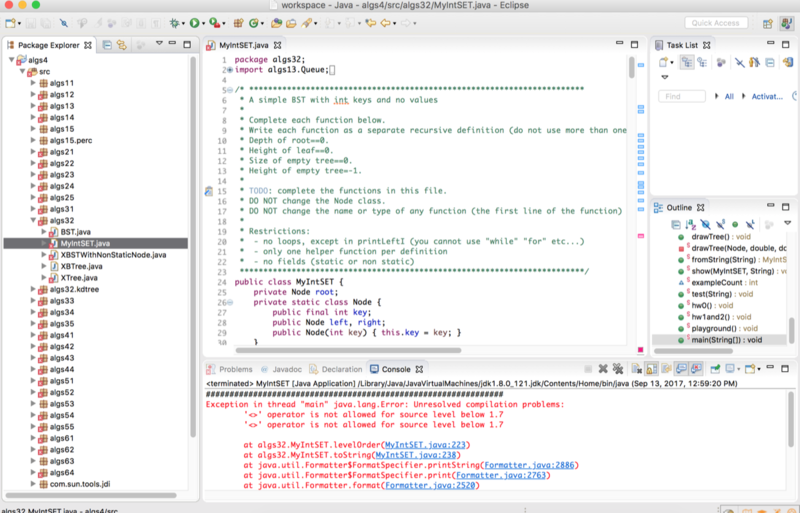 Every java class resides in a package, in this case algs11. 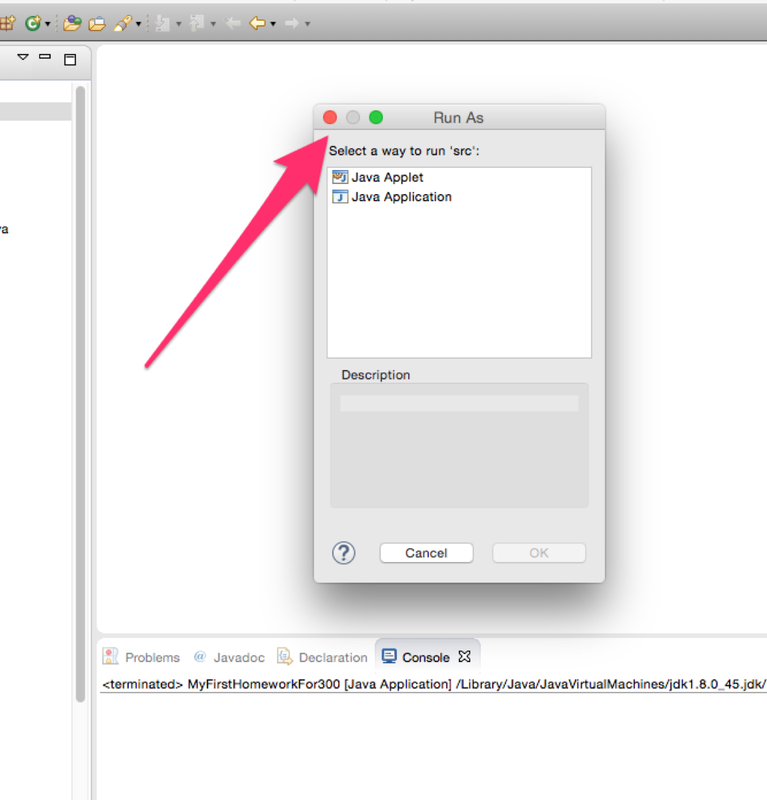 Java includes visibility annotations, such as public and private. In python, everything is public. Java functions must include types for arguments and results, in this case String and void. Both java and python code is compiled before it is run. The python interpreter performs both these steps, interactively. 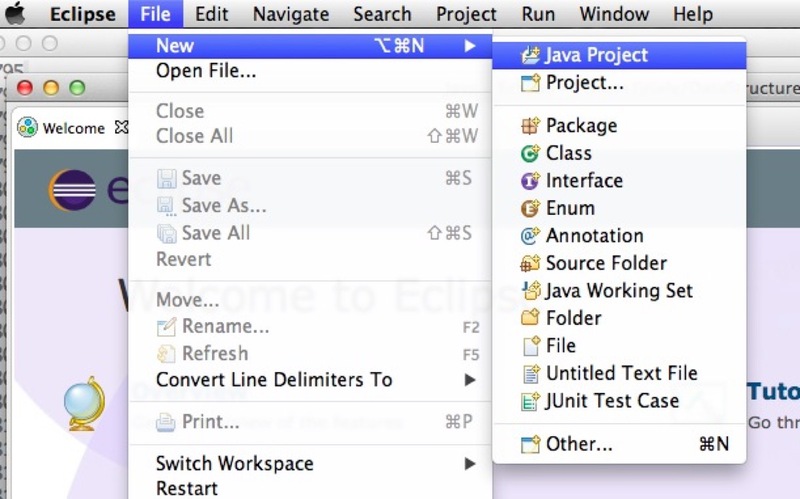 For java, we will be using eclipse, which continuously compiles your code. If the code successfully compiles (no red marks), then you can run it by pressing the play button. System.out and System.in refer to objects. I don't want to talk about objects yet, so we will use the version about, which replaces System.out with StdOut. StdOut is a class in the stdlib package. System is a class in the java.lang package. All of the classes in java.lang are imported implicitly into every java program. All other classes must be imported explicitly. The statement import stdlib. * makes the classes declared in stdlib visible in our program. Remove the import statement and see what happens. Instead of importing every class from a package, you can also import a single class. Try replacing import stdlib. * with import stdlib.StdOut. Unnecessary imports will generate a warning. If your code has a compiler error, it will not run. 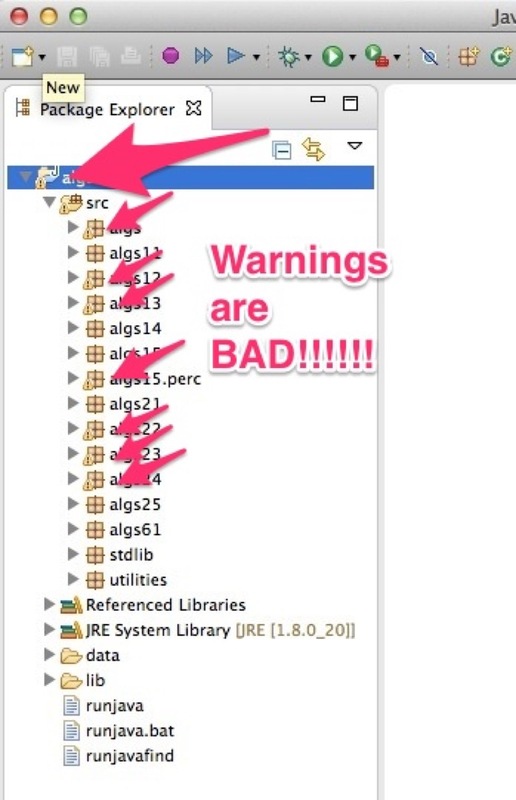 If your code has a warning, you can run it. But you should fix the warning. As an alternative to using import, you can also use a class's fully qualified name, which includes the package explicitly. Fully qualified names make code rather verbose, so usually people prefer to use import. In python, values are typed, but variables are not. 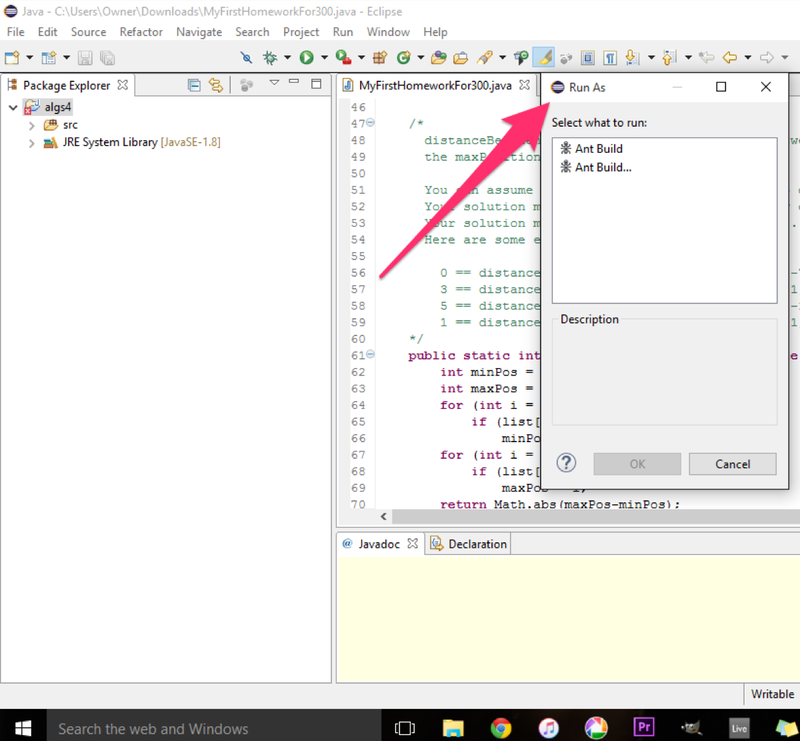 In java, both values and variables are typed. Variable types must be explicitly declared. The declaration and initialization can be combined into a single statement. In both languages, + is used to represent string concatenation. Here's another version which does not use concatenation. Python allows a single variable to be used at multiple types. By typing variables, java catches more errors before runtime. Java does more implicit conversions than python. You can safely ignore the rest of this slide, which uses some more advanced java features that you don't need just yet. The special class java.lang.Integer is used to create objects holding a single integer (more later). All java objects can be referenced at type Object. Using these properties it is possible to mimic the original python code above, but java requires explicit casts in order to apply the concatenation and subtraction operators. Java will do implicit conversions in some places. Try removing the casts in the code above. The difference between the two casts occurs because every java object can be converted to a String, using java.util.Objects.toString. In some contexts, this will be done implicitly. Java uses semicolons and curly-braces, where python uses newlines, colons and indentation. When formatting java, the conventions for indentation and newlines mimic those of python. But in java, these are just conventions, not requirements. Try removing the newlines in the python and java code above. Java requires declaration of return type and parameter types. Because of types, java compiler can catch more errors, as below. What's wrong? To get autocompletion when typing characters other than . paste the following in the textfield for "Auto activation triggers for Java"
"Preferences" > "General" > "Appearance" > "Colors and Fonts" > "Basic" > "Text Font" > "Edit..."
The stdlib package contains a class Trace which can be used to visualize the execution of programs. 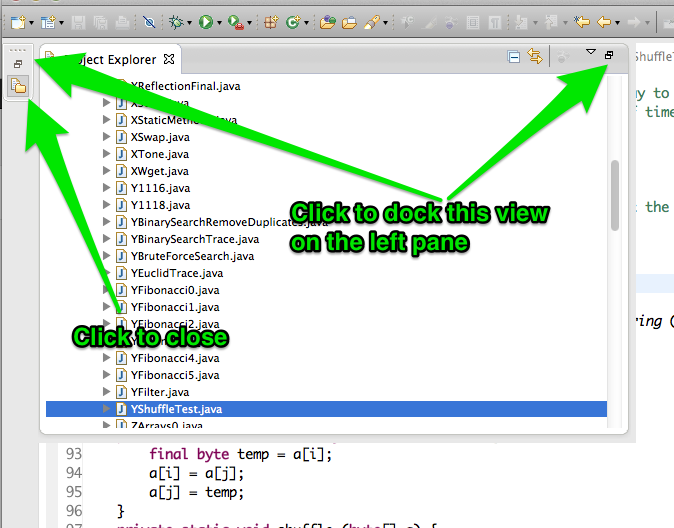 Trace.run() causes the program to be run in a debugger. Trace.drawSteps() causes a drawing to be created at every step of the contains method. The drawings will be created in a folder on your Desktop. To change the location, or for further discussion, see here. Try it with int replaced by Integer. Computer executes instructions using a memory. 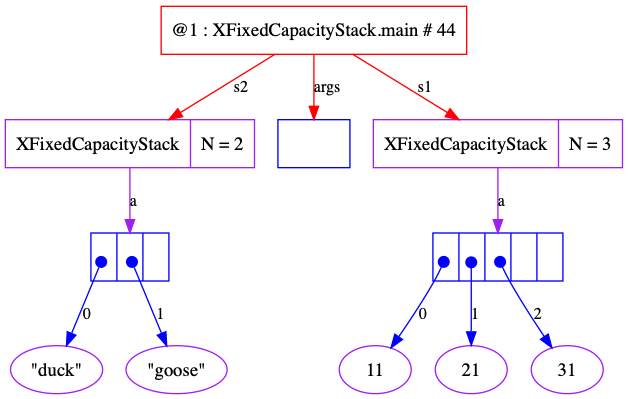 A data structure is a way to organize memory to make computation efficient. Think of a stack of plates. 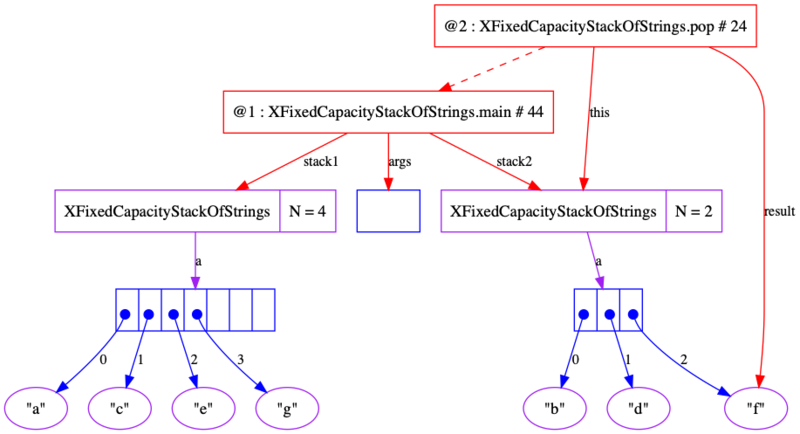 The ADT for a stack has operations push and pop. A data structure gives code for these methods. Local variables are stored in method invocations. Fields are stored in objects. The keyword static changes the meaning of fields and methods. A generic class has a type parameter. Type is not stored at runtime. Some language features use special interfaces, such as Iterable. method has "this" does not have "this"
class has "this$0" does not have "this$0"
Java compiler removes names for variables. Only the values are stored at runtime. The variable names are replaced with numbers (offsets in memory). This is one characteristic of static languages. Python keeps names for variables at runtime. It stores a map (aka, a dictionary) from variable names to values. This is characteristic of dynamic languages. Java's approach is more efficient. Python's is more flexible. procyon and cfr are particularly nice.